[login to view URL] see attached archive. 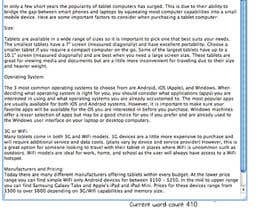 We want to make about 50 category reviews explaining the most important things in the buying process of a mobile phones, fridges, televisors, etc.., about 300 words. You have to be an tech expert and have native english. If you want you can send us, a example of a category do you want to see your work. I am very interested in doing this job for you. I am a native born English speaker (American) and I attended University for engineering. Additionally, consumer electronics and technology is a personal interest of mine and I am proficient in technical writing. I will post a writing sample soon. I am curious though - what will you be using these reviews for?